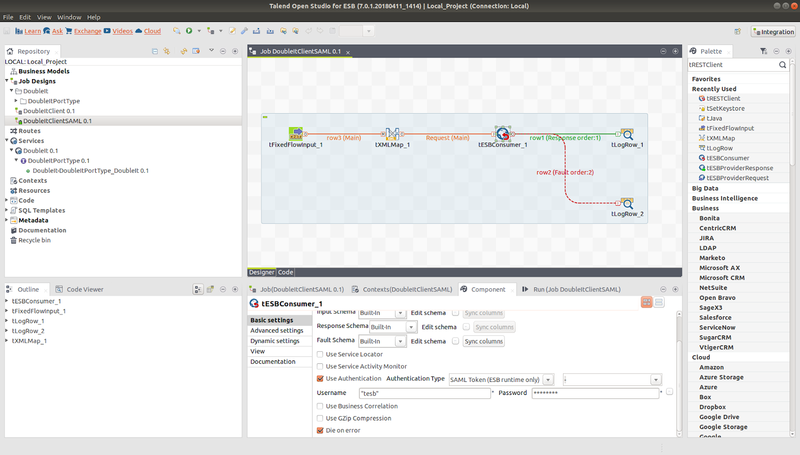 This is the seventh and final article in a series on securing web services using Talend's Open Studio for ESB. First we covered how to create and secure a SOAP service, client job and route in the Studio, and how to deploy them to the Talend runtime container. In the previous post we looked instead at how to implement a REST service and client in the Studio. 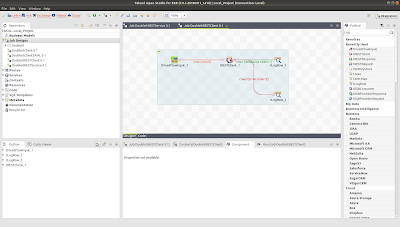 In this post we will build on the previous post by showing some different ways to secure our REST service when it is deployed in the Talend container. Previously we saw how to secure the SOAP "double-it" service in the container using WS-Security UsernameTokens. In this section we'll also secure our REST service using a username and password that the client supplies - this time using HTTP Basic Authentication. Open the REST service we have created in the Studio, and click on the 'tRESTRequest' component. Select "Use Authentication" and then pick the default "Basic HTTP" option. Save the job and build it by right clicking on the job name and selecting "Build job". As for SOAP services, we can also secure our REST webservice using SAML. 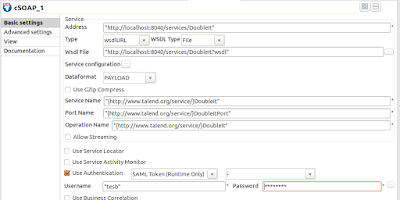 Instead of having the REST client to create a SAML Assertion, we will leverage the Talend Security Token Service (STS). 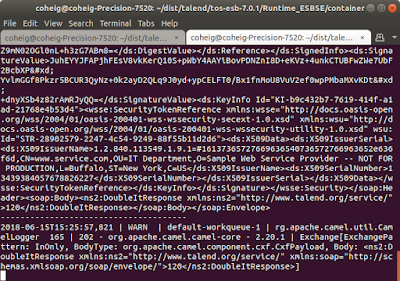 The REST client will use the same mechanism (WS-Trust) to authenticate and obtain a SAML Token from the Talend STS as for the SOAP-case. 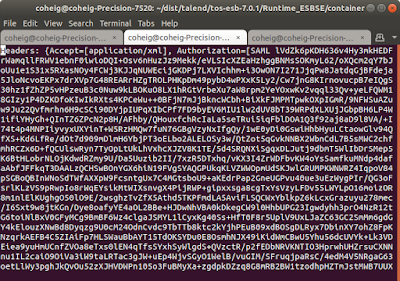 Then the REST client inserts the SAML Token into the authorization header of the service request. The service parses the header and validates the signature on the SAML Token in exactly the same way as for the REST request. 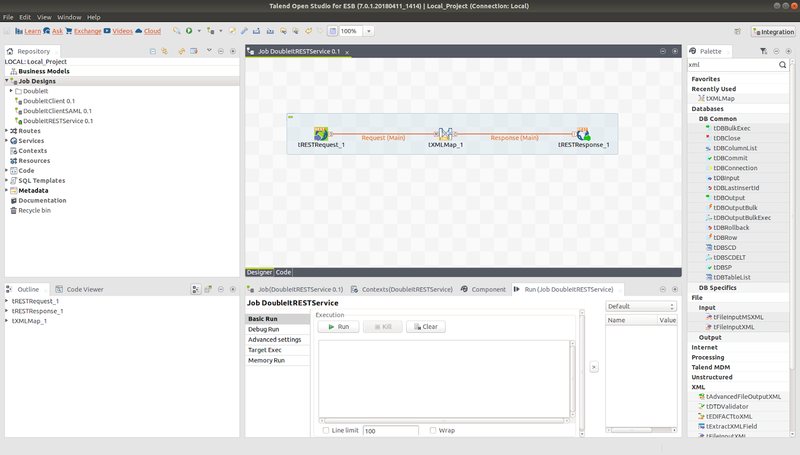 This is the sixth article in a series on securing web services using Talend's Open Studio for ESB. 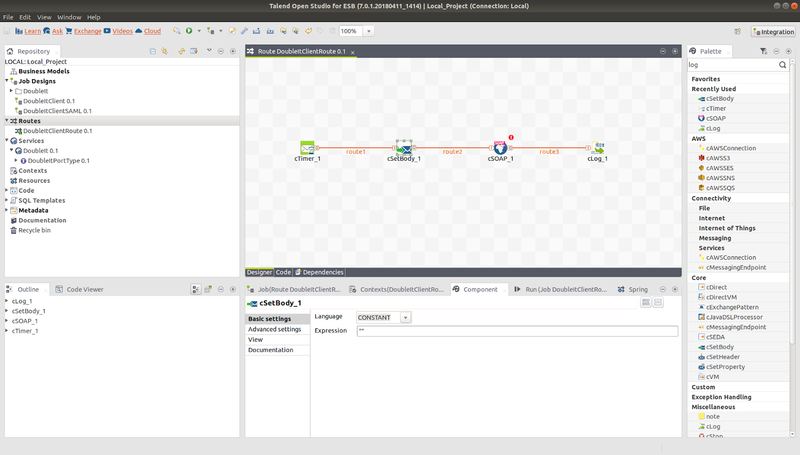 Up to now we have seen how to create and secure a SOAP service, client job and route in the Studio, and how to deploy them to the Talend runtime container. For the remaining articles in this series, we will switch our focus to REST web services instead. In this article we will look at how to implement a REST service and client in the Studio. Now save the job and run it. The service response should be displayed in the window of the run tab. 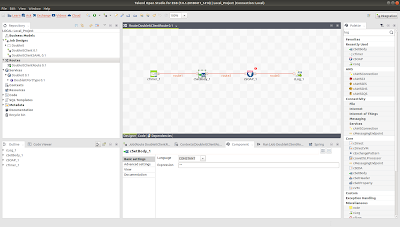 In the next article, we'll look at how to secure this REST service in the Studio when deploying it to the Talend runtime container. 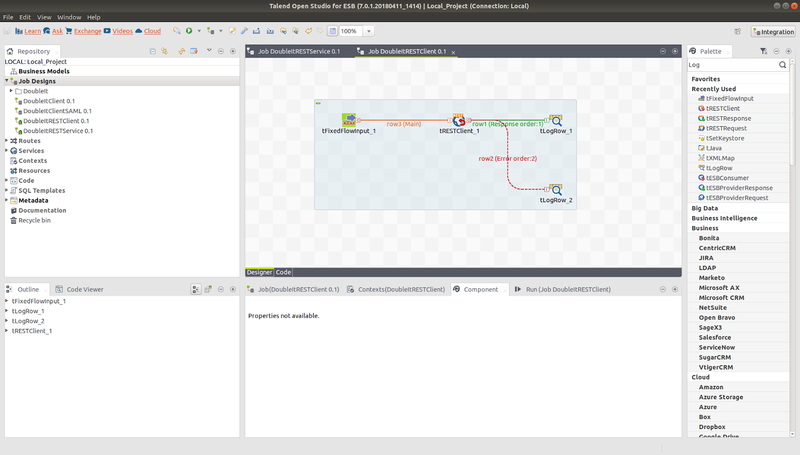 This is the fifth article in a series on securing web services using Talend's Open Studio for ESB. 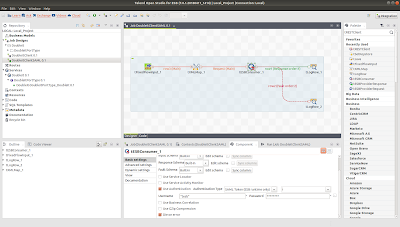 So far we have seen how to design a SOAP service and client in the Studio, how to deploy them to the Talend runtime container, and how to secure them using a UsernameToken and SAML token. In addition to designing 'jobs', the Studio also offers the ability to create a 'route'. Routes leverage the capabilities and components of Apache Camel, which is a popular integration framework. In this article, we will design a route to invoke on the SAML-secured service we configured in the previous tutorial, instead of using a job. Now we will configure the 'cSOAP' component. First, deploy the SAML-secured SOAP service on the container (see previous tutorial) so that we have access to the WSDL. 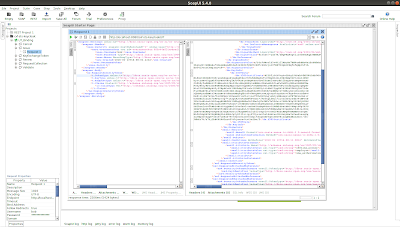 Double-click 'cSOAP' and enter 'http://localhost:8040/services/DoubleIt?wsdl' for the WSDL and hit the reload icon on the right-hand side and click 'Finish'. We will use the default dataformat of 'PAYLOAD' (the SOAP Body contents we set in 'cSetBody'). Select 'Use Authentication' and then pick "SAML Token". 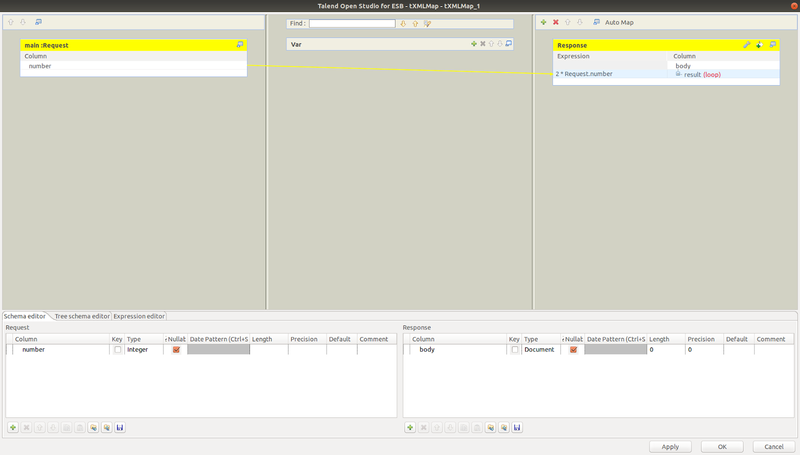 Input 'tesb' for the Username and Password values, and save the route. The Apache CXF STS (Security Token Service) is a web service (both SOAP and REST are supported) that issues tokens (e.g. SAML, JWT) to authenticated users. It can also validate, renew and cancel tokens. To invoke successfully on the STS, a user must present credentials to the STS for authentication. The STS must be configured in turn to authenticate the user credentials to some backend. Another common requirement is to retrieve claims relating to the authenticated user from some backend to insert into the issued token. In this post we will look at how the STS could be combined with Keycloak to both authenticate users and to retrieve the roles associated with a given user. Typically, Keycloak is used as an IdM for authentication using the SAML SSO or OpenId Connect protocols. However in this post we will leverage the Admin REST API. I have created a project on github to deploy the CXF STS and Keycloak via docker here. Checkout the project from github. The STS is configured is a web application that is contained in the 'src' folder. The WSDL defines a single endpoint with a security policy that requires the user to authenticate via a WS-Security UsernameToken. The STS is configured in spring. Essentially we define a custom 'validator' to validate the UsernameToken, as well as a custom ClaimsHandler to handle retrieving role claims from Keycloak. We also configure the STS to issue SAML tokens. Keycloak will return a HTTP status code of 401 if authentication fails. We allow the case that Keycloak returns 403 unauthorized, as the user may not be authorized to invoke on the admin-cli client. A better approach would be to emulate Apache Syncope and have a "users/self" endpoint to allow users to retrieve information about themselves, but I could not find an analogous endpoint in Keycloak. 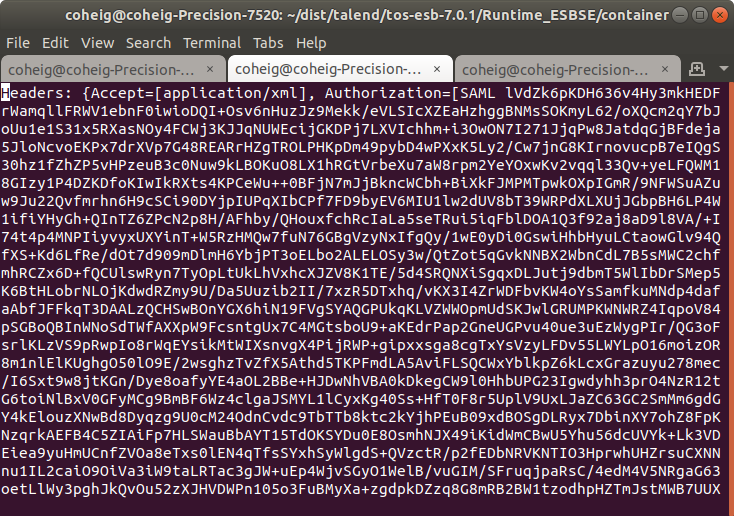 Role claims are retrieved via the KeycloakRoleClaimsHandler. This uses the admin credentials to search for the (already authenticated) user, and obtains the effective "realm-level" roles to add to the claim. 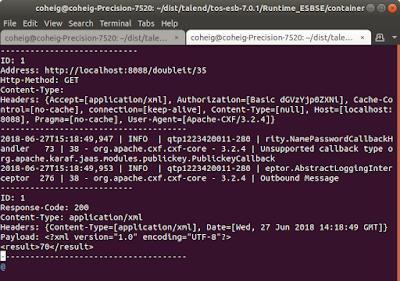 docker build -t coheigea/cxf-sts-keycloak . This starts the STS on port 8080 and Keycloak on port 9080. Log on to the Keycloak administration console at http://localhost:9080/auth/ using the username "admin" and password "password". Click on "Roles" and add a role for a user (e.g. "employee"). The click on "Users" and add a new user. After saving, click on "Credentials" and specify a password (unselecting "Temporary"). Then click on "Role Mappings" and select the role you created above for the user. Click in the Properties box in the lower left-hand corner and specify the username and password for the user you created in Keycloak. Finally, right click on the request and select "Add WSS UsernameToken" and hit "OK" and send the request. If the request was successful you should see the SAML Assertion issued by the STS on the right-hand side. In particular, note that the Assertion contains a number of Attributes corresponding to the roles of that particular user. 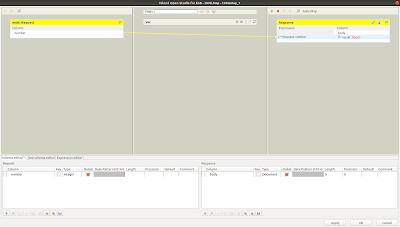 Apache Kerby is a subproject of the Apache Directory project, and is a complete open-source KDC written entirely in Java. Apache Kerby 1.1.1 has been released recently. 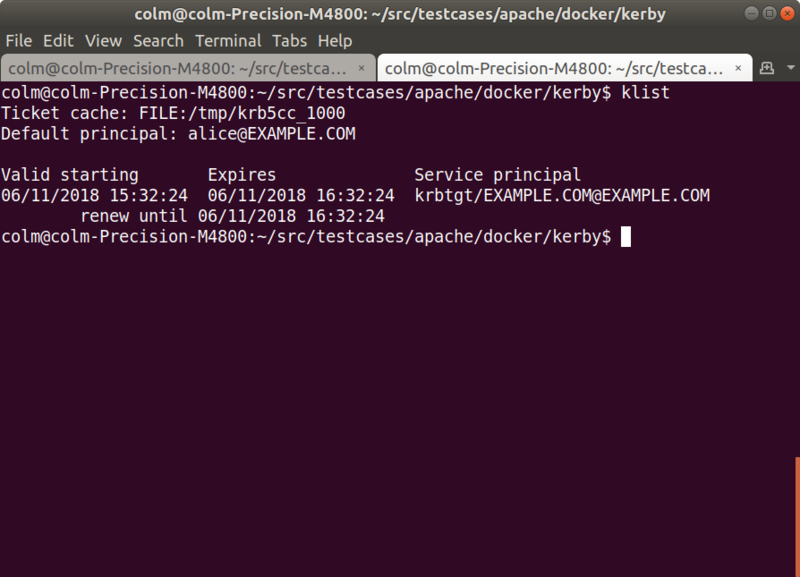 Last year I wrote a blog post about how to configure and launch Apache Kerby, by first obtaining the source distribution and building it using Apache Maven. In this post we will cover an alternative approach, which is to download and run a docker image I have prepared which is based on Apache Kerby 1.1.1. 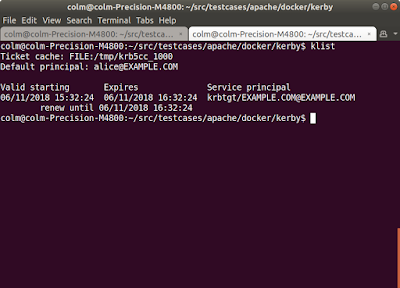 The docker image builds a KDC based on Apache Kerby and runs it when started. However, it expects a directory to be supplied as the first argument (defaults to '/kerby-data/conf') containing the configuration files for Kerby. The github repository contains the relevant files in the 'kerby-data' directory. As well as the configuration files, it stores the admin keytab and a JSON file containing the default principals for the KDC. This will get you a ticket for "alice", that can be inspected via "klist". 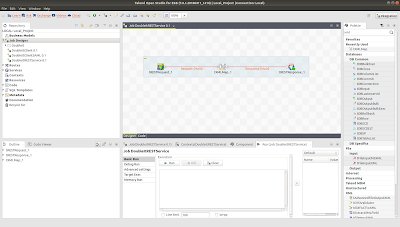 This is the fourth article in a series on securing web services using Talend's Open Studio for ESB. 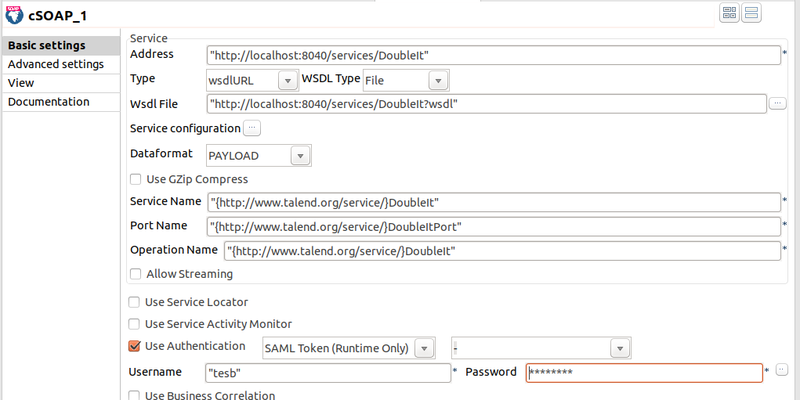 In the previous article, we looked at how to secure a SOAP webservice in the Talend container, by requiring the client to authenticate using a WS-Security UsernameToken. In this post we will look at an alternative means of authenticating clients using a SAML token, which the client obtains from a Security Token Service (STS) also deployed in the Talend container. This is more sophisticated than the UsernameToken approach, as we can embed claims as attributes in the SAML Assertion, thus allowing the service provider to also make authorization decisions. However, in this article we will just focus on authentication. As in the previous article, first we will secure the "double-it" webservice we have designed in the Studio in the first article, by requiring clients to authenticate using a SAML Token, which is conveyed in the security header of the request. 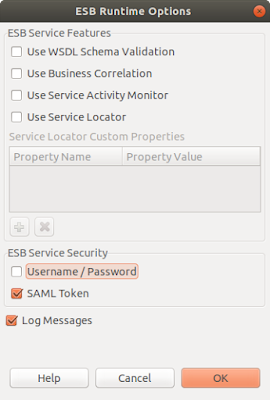 SAML authentication can be configured for a service in the Studio, by right-clicking on the "DoubleIt 0.1" Service in the left-hand menu and selecting "ESB Runtime Options". 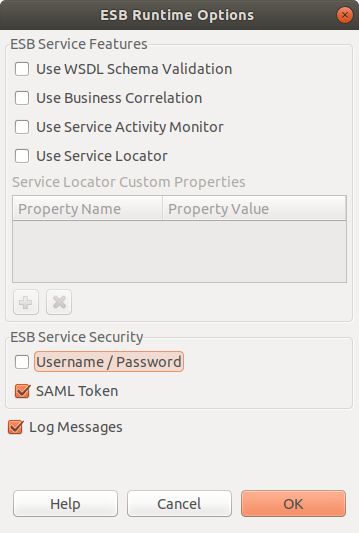 Under "ESB Service Security" select "SAML Token". Select "OK" and export the service again as detailed in the second article. Now start the container and deploy the modified service. 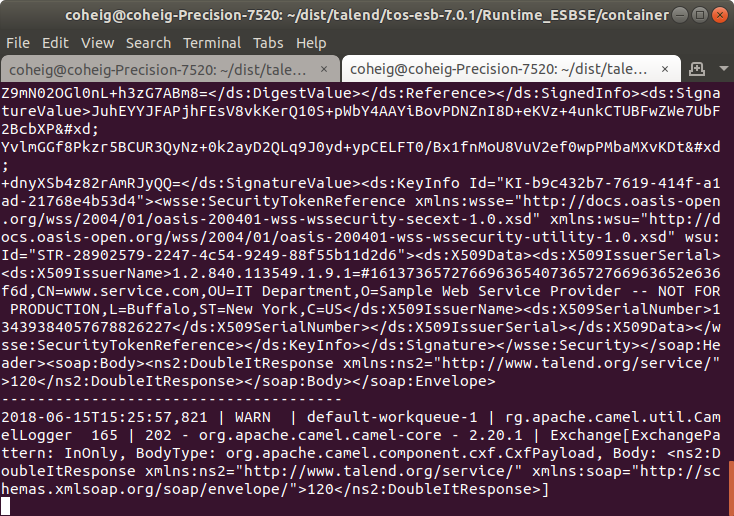 Note that what selecting the "SAML Token" actually does in the container is to enforce the policy that is stored in 'etc/org.talend.esb.job.saml.policy', which is a WS-SecurityPolicy assertion that requires that a SAML 2.0 token containing an X.509 certificate associated with the client (subject) must be sent to the service. In addition, a Timestamp must be included in the security header of the request, and signed by the private key associated with the X.509 certificate in the Assertion. Next we have to update the client job to include a SAML Token in the Studio. Open the "tESBConsumer" component and select "Use Authentication", and then select the "SAML Token" authentication type. The propagation options are not required for this task - they are used when a SOAP Service is an intermediary service, and wishes to get a new SAML Token "On Behalf Of" a token that it received. Enter "tesb" for the username and password values (this is one of the default users defined in 'etc/users.properties' in the container). Now save the job and build it. Now deploy the client job, and it should succeed, with the response message printed in the console. 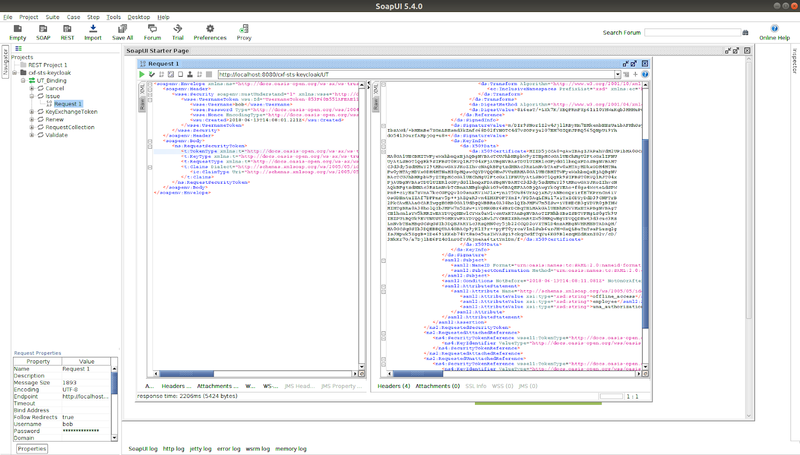 The log 'log/tesb.log' includes the client request and service response messages - in the client request you can see the SAML Assertion included in the security header of the message.